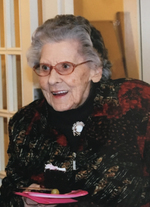 Annie Haddock Obituary - Forest, Ontario | Gilpin Funeral Chapel Ltd.
"We'll miss you very much, Nannie. Thanks for bringing a smile to those who had "
" Gone from our touch, but will always remain in our Hearts." 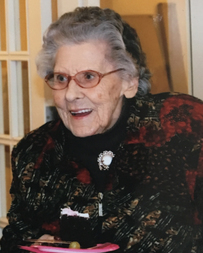 Annie Gladys (Day) Haddock passed away Friday, October 27th at North Lambton Lodge in Forest in her 98th year. Mother of Wendy & Bob Brown of Forest and Carl & Tracey Sims of Whitby. The spunky nature of Annie will be missed by her Grandchildren Chris, Mike & Stacey, Mark, Todd, Kelly & Kristy, Great Grandchildren Sarah, Lorne, Carter & Raychel, Charles, Ellie, Isabel, Christopher, and Great Great Grandson Hunter. Annie was full of smiles, stories and maybe just a little bit of sparkle. She lived the life that she wanted. Annie will be missed by friends and family, but always remembered as one in a million. A private family memorial will take place with interment at Mt. Pleasant Cemetery in Toronto. ChildCan is a charity organization that raises funds to provide responsive and compassionate support services to families facing the journey through childhood cancer – from diagnosis, through treatment, to recovery or bereavement. (www.childcan.com) This organization was special to Annie and donations are appreciated her in Annie's name. The family would like to thank the staff at North Lambton Lodge for their loving kindness during Annie's time at the Lodge.